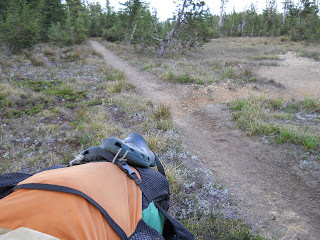 August 14: I woke up to a strong wind, but as long as it kept the mosquitoes away, I wasn't going to complain. 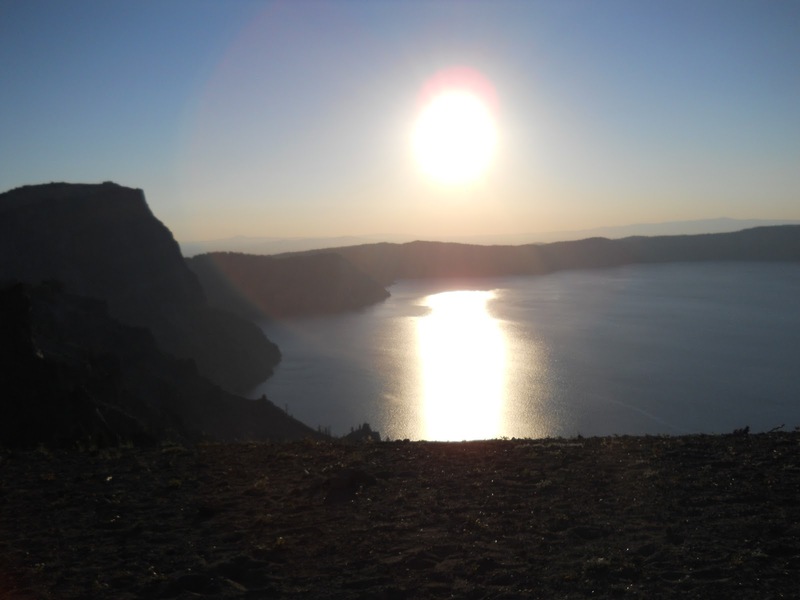 Not to mention waking up to the spectacular view known as Crater Lake. Shortly after sunrise, I was back on the trail hiking. 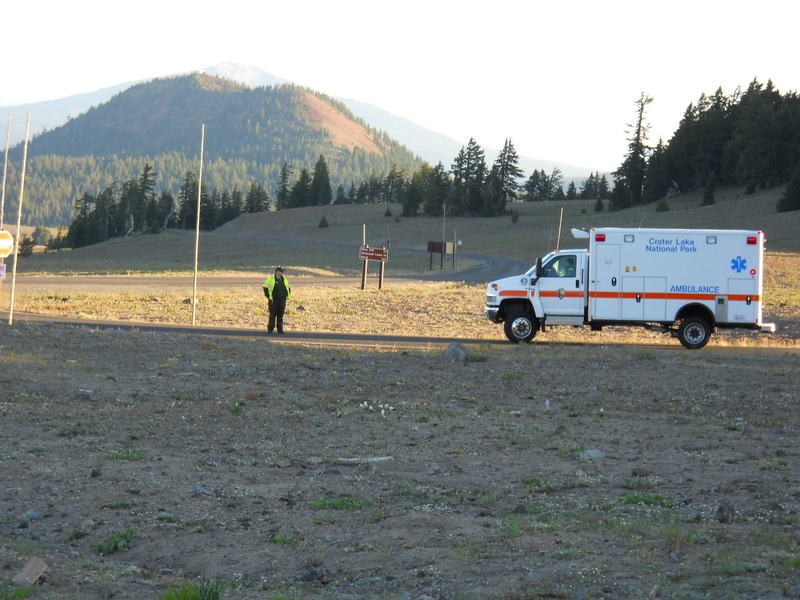 Near where the trail crossed the rim road, an ambulance was parked. 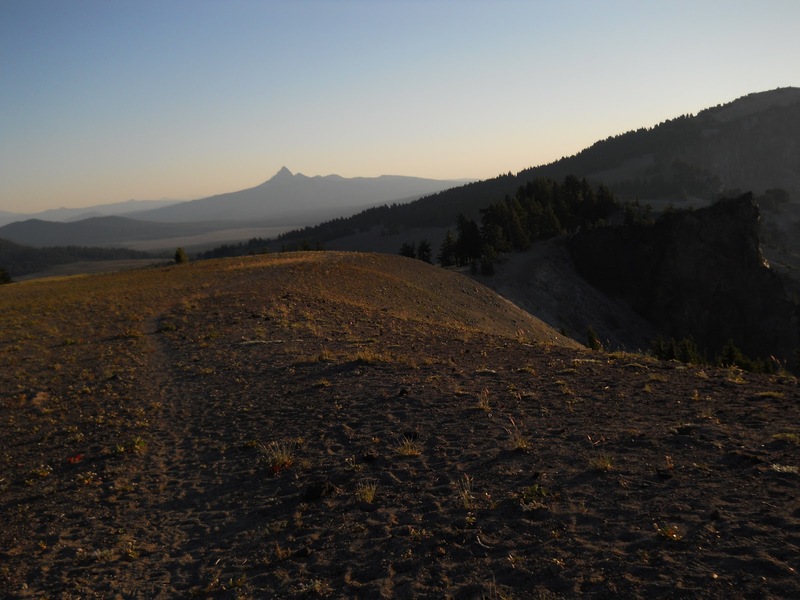 The road forks there, one direction continuing along the crater's rim while the other headed north to who knows where. Getting closer, I could see a sign directing runners to turn there. Guess there must be a race going on today, but I certainly didn't see any runners. Thinking back to the day before, at one parking area along the rim road that intersects the trail, I noticed a long line of porta-potties. The porta-potties outnumbered the people parked at the trailhead by about 10 to 1 and it seemed like a ridiculous number for such a small parking area, but now that mystery been lifted: runners. Those porta-potties were for the runners that, presumably, would be running today. 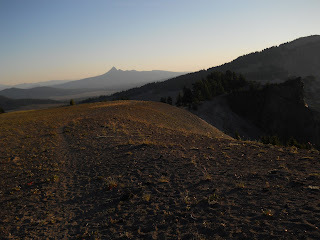 I didn't care about running, though, and followed the trail down the north side of the crater where it hooked up with the official PCT once again and dived back into the trees. off in the distance. I expected to hike past it by sunset. Late in the day, I reached Thielson Creek--the first water source in 25 miles--where I found Double D just about ready to soak his feet. He kindly waited until after I filled up with water before dunking his feet. Just Dave and Red Head, he told me, were just ahead on the trail. 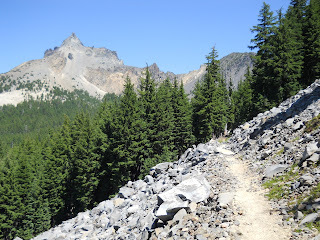 Not a big surprise since I had seen them the afternoon before at Crater Lake. Double D asked about my camp on the rim (wonderful! 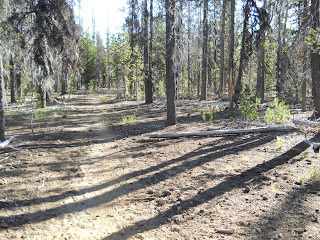 ), and I asked about their camp off the rim (buggy and horrible!). Double D looked to be in quite a bit of pain. He wasn't actually thru-hiking the trail and had only been on it for a week or two, so he was still suffering from blisters and the usual problems associated with starting a long-distance hike. Trying to keep up with his friend from home, Red Head, was a challenge. Red Head was thru-hiking and had come all the way from Canada. But Double D was determined to keep up, planning to complete his first 30 mile day that afternoon. But his feet were suffering badly from the distances he had not yet grown accustomed to. 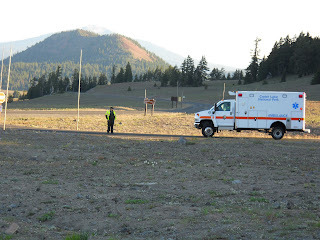 The ambulance drivers seemed to be directing traffic. Several more miles further along the trail, I caught up with Just Dave who was standing near a sign marking the high point of the PCT for the Oregon/Washington section of the trail. "It's all downhill from here!" I told Just Dave, but neither of us really believed that. =) The high point for Oregon and Washington was rather anti-climatic. 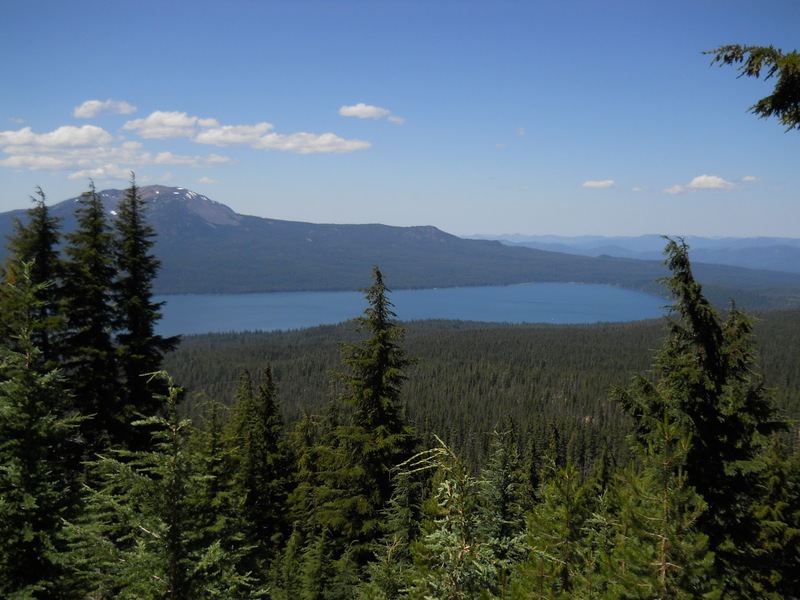 The area was mostly above tree line so we could actually have views, but it was like standing in the middle of a large plateau rather than on the edge of the plateau where the sweeping views would be found. Just Dave was on his cell phone, talking to his wife. I didn't image there would be a signal out here--where the heck did that come from?--but I followed his example and pulled out my cell phone and Peek device. The cell phone didn't get a signal, but I was able to download my e-mail with the Peek. =) Just Dave finished his call and continued on while I sat down and went through e-mail. Double D caught up and limped passed me while I was attending to 'business.' Which included downloading a weather report predicting afternoon thunderstorms for the next few days. I didn't like that forecast and tried downloading a new one, but it sent me the same miserable forecast again. Stupid computers. I passed ahead of Double D about a half hour after leaving, eventually coming to a stop at the trail junction for Miller Lake and a nice little spot for a camp. Just Dave and Red Head had also decided to stop there so I actually had company for the night. 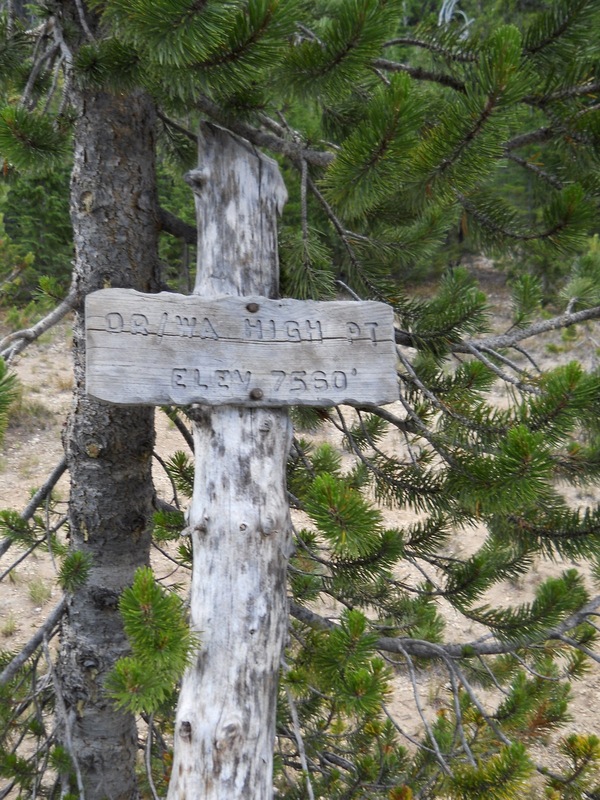 Seemed like eons since I actually camped with any other hikers. Diamond Lake, off in the distance. 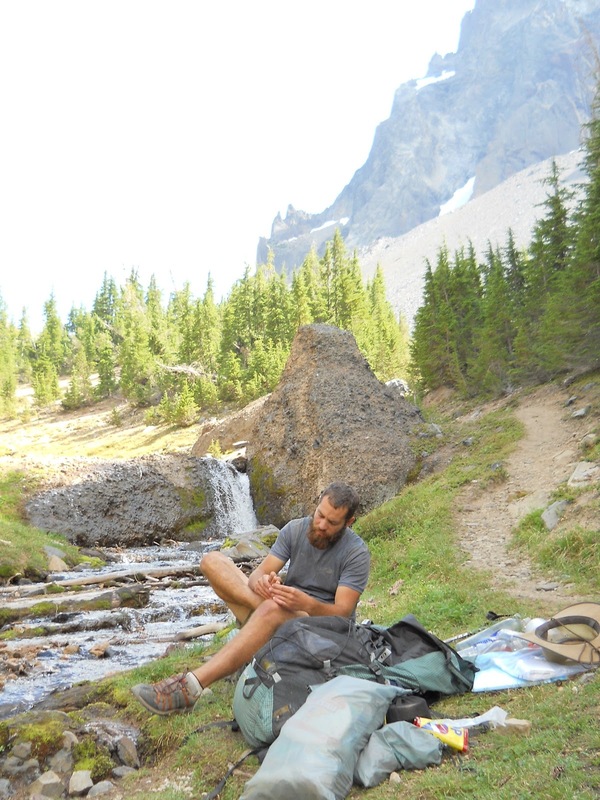 Double D examines his poor, pitiful feet along Thielson Creek. 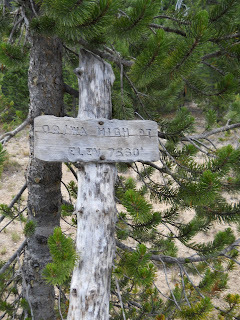 This sign marks Oregon and Washington's high point on the PCT. After checking my e-mail, I took this photo before getting up again. Beautiful sunrise.... glad you got to have some company, for a change. Crossing Another Arbitrary Political Boundary!